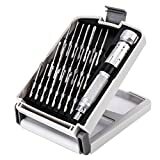 There are hundreds if not thousands of different screwdriver sets on Amazon, but the Nanch Small Precision Screwdriver Set with 22 Alloy S2 Steel Bits has to be our favorite. This awesome kit includes all the bits you could possibly need to take care of all the devices you have around the house, and the screwdriver base has an awesome design that can telescope to reach just about anywhere. Trust us, it’ll be the best $19.99 you’ll spend all week.